I really like my Samsung Galaxy S I9000, and after 6 months I still think its the best phone for me. Unfortunately it still has its faults just like any other phone. Without going into crazy detail here is the gist of the infamous lag issue and what I think is the easiest way to fix it on any I9000 running Froyo (Android 2.2). Samsung's proprietary file system (RFS) simply lacks what it needs to perform properly on the I9000 and other related models (I9000T for the Aussie Telstra users). Access and write times start to increase over time when accessing the different system, cache and application storage drives/partitions, lagging dramatically after a few months of use and a decent collection of apps installed. (here is a much better description than I can put together). Despite the mass user complaints over the last 8 months is doesn't look like Samsung will be moving away from RFS any time soon. Around a week ago an Official European I9000 Android 2.3.3 update (supposedly final version) was leaked, and after a little probing a senior Android kernel developer named supercurio (François Simond) found the new firmware still uses and formats to RFS. Android 2.3 supposedly corrects the issues which required the use of RFS so this decision has left few people puzzled as to why samsung has kept persisting with it. 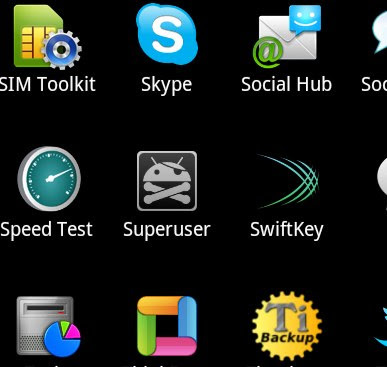 Fortunately there are some great projects and tools that will help anyone willing to convert or replace their phones RFS partitions over to a more friendly and proven file system. One of the most notable ones being the open source Project Voodoo, who's main author is previously mentioned supercurio. The Voodoo mod replaces the stock Android kernel and converts the concerned drives to Ext4, which is a major improvement over RFS (it also tweaks and adds some other features relating to sound and colour but I'm not going to go into that in this post). This is a proven mod and arguably the most popular/highly regarded. It's certainly the best out of the three I've tried. Here's what I think is the simplest way to get the Voodoo mod onto any Galaxy S I9000 (the 'international version' of the Galaxy S). Before you begin... This method is for Android 2.2 only. This method doesn't require "3 button recovery". Any kind of root exploit, kernel changing/tweaking and flashing is bound to void warranty and involves a large amount of risk. If an instruction doesn't make sense don't keep pushing through, ask questions. Gain root your Galaxy S I9000. Most users who would be interested in fixing the lag issue would probably have root access to their i9000 already, but if you haven't you will need to do so. I've had a lot of success with z4root, get it here (you will need to create a free account with xda-developers, but its worth it). Copy the downloaded z4root app to your phones SD card. Turn on the ability to install from non-Market applications, goto Settings -> Applications then tick Unknown sources. Browse to your SD card and touch the z4root.1.3.0.apk file to install and follow the prompts. Once installed head to your applications menu and run the z4root. Touce the Permanent root button. After a couple of seconds your phone will reboot and you will see the Superuser app has been installed. Install SGS Kernel Flasher. This step is pretty easy, simply head to the market and search for SGS Kernel Flasher or head to http://t.co/MTlXb8H. Run the app once its installed, and touch the backup kernerl button. Prepping and flashing Voodoo mod. Head to http://dl.project-voodoo.org/ and download the latest stable Froyo (Android 2.2) Voodoo mod. It should be in the form of Voodoo-stable-5.5.3-Froyo-GT-I9000-unsigned-update.zip. Only download the undate-unsigned.zip version (the .tar version is designed for a completely different flashing method). Place it the download in a folder called Voodoo on the phones main SD 16GB storage. Run SGS Kernel Flasher, touch choose kernel, locate the Voodoo file in the newly created Voodoo folder, and finally touch flash kernel. It should take around 20 seconds and then your phone will reboot. After the phone has rebooted it will sit on the first Galaxy S screen for around 3 minutes while it converts the file system. While this is happening you should get a female voice telling you what is being performed and how much time is remaining. If you don't get this I think its pretty safe to say it hasn't worked, and you should start asking questions before trying again. When your phone finally boots the entire process is complete! To confirm the mod is up and running install the Voodoo Control app from the Market, heres the direct link http://t.co/vAf7JqJ (or the donate app if you found it useful http://t.co/UHr01YT). It should look like this when scrolling to the bottom (Note the Status: Ext4 lagfix active). You should notice a speed difference straight away, especially when installing and running apps. Hopefully this helps anyone who stumbles across my blog and wants a simply way to stop the lag issues, or even provides a method for users who don't know/don't want to use the flash tool Odin, and any user who doesn't have access to 3 button recovery (like me). Brother you have solved my problems....been trying to find out a way around this. Thank you. Well done Gus! Dead easy fix. Good stuff Rob, glad it worked! My first mod to my galaxy and such a huge speed improvement I don't think I'll do anything else. Thanks for the guide. Yeah a lot of friends have said the same thing. Good to hear! Hi gus, thanks for the tuto, very nicely presented. although i've run into some problems. and was wondering if you could point me in the right direction. I followed the steps except for the root process, because i had done that in the past aleady when changing to froyo, and already had a superuser prog installed although not the one you suggest. anyway when rebooting i get the female voice, saying what's being done, but the phone doesn't stay on the first screen for the said three mins and the female voice doesn't give me a remaining time. instead the phone proceeds to continue booting. but never really gets there all i get is a blank screen with half the taskbar at the top and every 30 seconds to a minute a get a buzz and then a double buzz.I tried rebooting the phone and the same thing happens, going round in circles unil the batt runs out. do you think this this is fixable, and if so what would you recommend. i'm prepared to get my fingers dirty but would like to not have to do a factory rest if possible. Oh not cool, but I definitely think its fixable. Double buzz usually/could mean a process has frozen, which isn't a good sign at boot. Ok, trying to avoid a factory reset the first thing that comes to mind is disabling Voodoo lag fix in recovery mode (access by the "three button recovery" on the galaxy s). This involves powering the phone down completely (pull the battery for a few seconds just to make sure), then while pressing and holding both the 'home button' (centre bottom) and 'volume up' buttons press and hold the power button. While holding those three buttons wait for the screen to turn on. Once the Galaxy S boot screen appears you can release the power button but keep holding the volume up and the home button. The phone should boot into the 'clockwork recoverymod 2.5..... voodoo lag fix' (release all buttons as soon as this appears). If you cant seem to get into this menu your Galaxy S may be one of the many (like mine) that was shipped with a broken three button recovery. Let me know if this is the case, I'll give you some more suggestions. If the phone boots into a differently named recovery mode let me know. When you are in the recovery be very careful as you can easily soft brick your phone. Using the volume buttons to move the selection and single clicking the power button to make the selection move down and select voodoo lagfix at the bottom of the menu. Then select disable lagfix, which should be confirmed in the information area at the bottom of the menu. Then select ++++++Go Back+++++, and then select restart the phone. If all goes well you phone should reboot, remove the mod, and then boot into the phone like normal. If that's the case Id say something was stopping your phone from properly converting the partition (obviously :b) and you will need to completely factory reset the phone (enabling voodoo lagfix in recovery after the reset) before trying again. If that isn't the case I have a few other things you can try (although most include factory resetting sorry). I hope that works for you, and I hope that made sense :) its very early morning here and I haven't had any caffeine yet. yes I can boot into recovery mode no problem, tried to disable the lagfix like you suggested but it didn't seem to make any difference. so I looked around in the recovery menu and managed to restore the phone to it's previous state by restoring the old kernel that "kernel flasher" backed up. so luckily now things are working as before, bit less stressed out now lol. but still wondering how i can change the fs to ext4. seeing as this method didn't work for me. 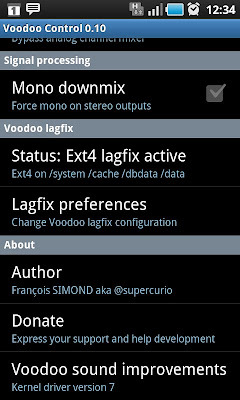 I am wondering if it might work better by changing rom to gingerbread and then trying the voodoo fix from there. I think i should do a full system backup first though as it seems like i might have to wipe the phone to get things to work. do you have any tips on doing a full system backup ? Ah good stuff! That was my next and last suggestion before factory reset. Good one for backing up, many people wouldn't bother. I haven't looked into Gingerbread and Voodoo yet, but it looks like dl.project-voodoo.org has all the kernels you need. I'll do some searching on it to, I might make another post on it. If Gingerbread isn't available to you through Kies yet (like me) check out www.darkyrom.com. Even if you don't want to run their full custom rom they have stock Gingerbread roms with Voodoo included ready for download. I ran Darky's Rom for a while, its very very good/fast and the forum community is awesome. As for system backup's the only system/app I've used it ROM Manager http://t.co/NO9XR5L (which I paid for). It's worked perfectly every time. It's the only system I can recommend, I haven't had much exposure to anything else. On a stock ROM and kernel it will require root access and it will flash the recovery so it can work its magic. The only tip I can think of is remember to copy the Clockwork fold from your SD card after its done. I've forgotten to do that a couple of times before formatting, which was silly. just a quick message to say thanks again, i followed your tips and used the darky rom 10.1 it's very well explained and now my phone is running on gingerbread and nice and smooth, now i just have to apply the lag fix and everything should be sweet. Good to hear :) They are a nice bunch of people, glad you like it. I hope lagfix converts properly next time, give me a shout if I can be of assistance.